Add 4 eSATA ports to your existing PCI-E equipped Mac/PC computer in order to easily connect to our eSATA products including: MS1UT, MS2UT, MS2T1, MS4T, MR5CT1. This revolutionary design use the latest Intel and Silicon Image 3124A chipset to provide PCI 8x interface to 4 eSATA connection. With Also support Port Multiplier, a single eSATA cable can connect up to 5 drives with Port Multiplier aware unit, such as TR4M and MS4UM. 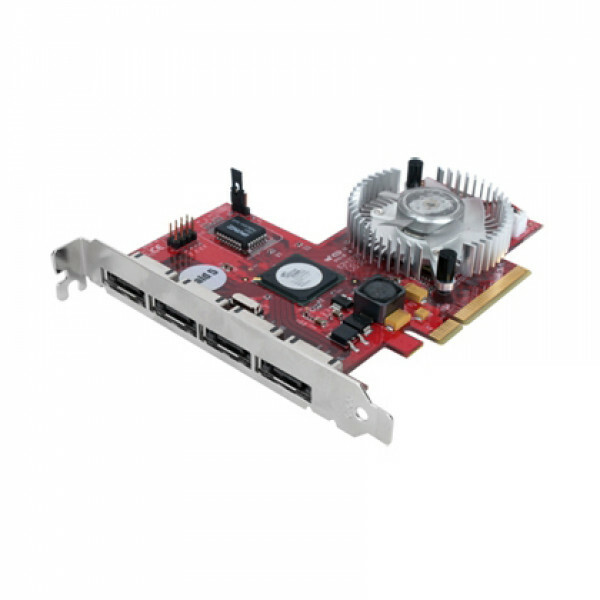 Compatible with the PCI-E equipped Mac G5 and Mac Pro, Windows XP, 2000, 2003 and Vista.